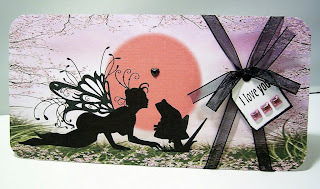 Large Fairy Globe Card - using peels offs on the globe base and glitter on the wings of the fairy and butterflies. Friendship Tag Book & Sleeve - I used the printed tags from the CD and decorated them with stamps, peel offs, flowers etc, all held together with a small ringbinder with various ribbons tied to it. 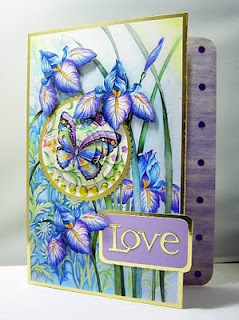 and wrapped around a 5x7 card with a background and "Happy Birthday" printed on it, the butterflies were printed, cut out, decorated with Sakura and gems and glued to the front of the card. 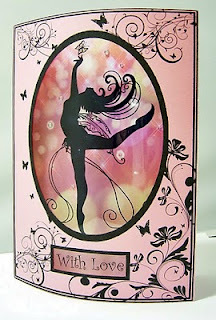 Large Dancer Card - I first printed the silhouette of the dancer onto white card, then the background was printed onto orange card and attached to a 10x7 base card, I edged around the rim of the card with a black inkpad to define an edge. Simple, but effective. 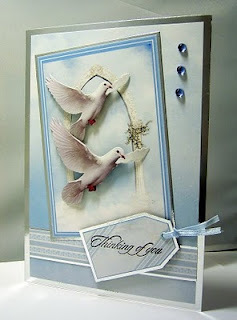 Thinking Of You - The main part of the card is taken from the "My Craft Studio's "Elements" section all I had to do was print off the doves and add some mirror card and gems. 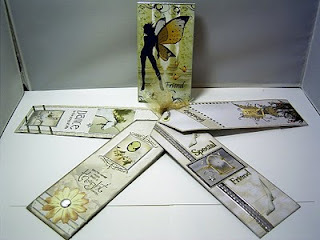 Large Butterfly Pyramage Card - Again the main part of this card is from the "Elements" section of the CD. I just pyramarged the butterfly added some "metallic domes", printed off and added a few more flowers and added the sentiment. The right of the card is cut slightly shorter than the back and I added a strip of pale lilac material, the edge of which I covered over with a thin gold peel off. Dome Card -The fairy was printed off and coloured with Coloursoft pencils and Sakura glitter pens. 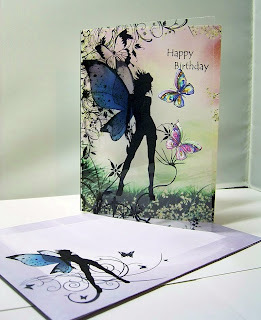 The inside of the card has a printed image and I also printed a larger pair of wings fromn the butterfly for the fairy. 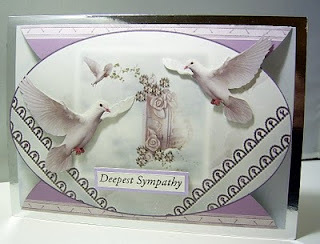 Deepest Sympathy Card - I printed off the image slightly larger so that I could "dome" it over a 7x5 card, I traced around the "lacy" part with dimentual pearlized paints and added the doves and sentiment. Find Yourself A Prince Card - Simply a printed off image with ribbons and sentiment attached. Because it's slightly wide than the base card you get this lovely "domed" effect. Well that's it, I hope you liked them. Oh My GOODNESS!!!! These are all absolutely beautiful!! I love every single one of them! The fairys and butterflies really caught my eye though! My favorites! They are truly just amazing! Such a great job you did on every single one!! Thanks so much for sharing your wonderful talents with us all! These are wonderful cards Vince. I waited too long and didn't get the POTW - bother. They are all gorgeous! Find Yourself a Prince is my favourite. Wow, Wow, WOW! 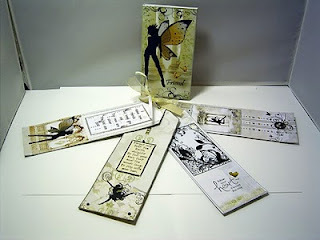 What amazingly wonderful creations!All stunning, but the tag book and the acetate fairy card are probably my favourites. They must've taken you weeks! Totally stunning creations, I love them. Just have to ask, where did you find all those beautiful fairies? Great cards, have saved them for inspiration when I get the CD. Wow am loving the globes and fairies Vince. They are stunning. Wish we could craft together so you could teach me :O). Your work is so inspirational hon, thank you so much for sharing. Absolutely stunning samples. My CD arrived today - can't wait to get home and have a play. Oh Vince!!! Your cards are amazing!!! Thankyou for taking the time to comment on mine! I love the dimension you get in all your cards!! 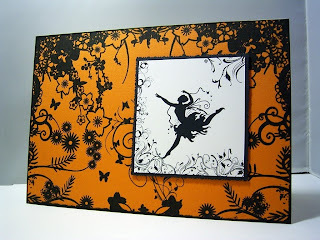 Oh my goodnes, your work is just amazing - such a vision you have in paper crafting! These are just stunning ..... sending hugs and awe from Miami, Florida! WOW Vince these are all gorgeous! You have showed off the MCS cd an absolute treat. Well done. I've just discovered your blog and have spent ages just looking at your cards , they are so beautiful. I've added you to my favourites list. Je suis arrivée sur ton blog par hasard et j'en suis ravie car tu as un blog super beau et tes cartes sont des MERVEILLES ! Bravo, continue à nous émerveiller. These cards are a real inspiration to us. Beautiful, beautiful designs!